Samford University will present its oldest holiday event, Christmas Around the World, Dec. 3 at 10 a.m. in Reid Chapel. 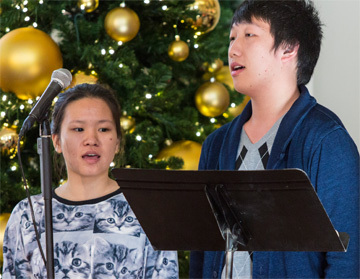 Christmas Around the World, hosted by the departments of World Languages and Cultures, Classics, and Religion, offers music and scripture readings in 20 languages. The tradition began with caroling in the 1950s and by the 1970s had become the university’s beloved holiday celebration of language and culture. The event is free and open to the public, but seating in Reid Chapel will be limited. Brooks Hall Auditorium will provide overflow seating. Anyone can watch Christmas Around the World via live video here.